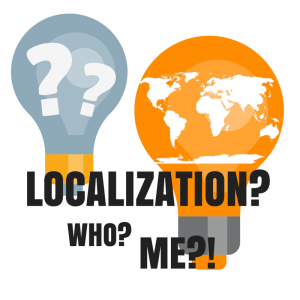 Localization means adopting the local culture and language to the product or service. Whether a business is B2C or B2B, customers are always humans who have different language skills. Languages affect people’s behavior in many ways. One can localize almost everything from software to websites, and from brochures to social media communication. If your business wants more sales… Simply said, localization grows the amount of potential customers by bringing your product or service closer to the hearts of more people. If your business can’t grow anymore in the current market… Every market has its limits. On a country level you might be the sovereign market leader but on a global level no one even knows you. There’s your potential to grow. If your business’ potential customer can be found all over the world… For companies with niche products or services a local market is rarely vital enough. It’s a pity if fantastic business ideas die away just because potential customers don’t know about the product or understand the message. We have the internet so spreading the word isn’t the problem but ‘the word’ might be if it’s in the wrong language. If your business doesn’t have new ideas to grow the business… Localization is too rarely included in the toolkit of growing businesses. Business literature lists all sorts of export tips and guidelines without acknowledging the power of localization. This is why localization often feels afterthought. Utilize your hard work and start transforming your current local assets to internationally interesting products and services now. If your business isn’t as big as you want to… Some companies are glad to stay local, and it’s totally fine. But if you want to keep growing, don’t forget to find out what localization could do for your business. Localization may sound difficult and complex. Depending on the context it might be a huge challenge, but there are plenty of options to do localization. One option is to turn to a localization service provider. They are professionals and know all the tricks of a localization projects. Second option is to hire a localization expert to your team. It might be surprisingly easy to integrate all localization processes to the existing development, marketing and sales processes with the help of a professional. Third option is to learn to localize. This might be the cheapest way if you’re motivated to do it right. In addition, there are a countless amount of combinations of all these methods. Explore and find the best localization option to your business. Try software localization by yourself. Multilizer is a localization tool which eases the localization process with automatic file management and quality validations. Learn more.